Coordination Chemistry XVI is a compendium of papers that deals with structured absorption band, intra-molecular electron transfer, and the influence of natural and synthetic ligands on the transport and function of metal ions in the environment. Experiments show that the chemical, spectral and kinetic results of the physical state of an enzyme can be a significant experimental variable that will change function-related-conformations. Another paper points out the dangers of assigning weakly structured bands to partially resolved vibrations, to lower symmetry, to spin-orbit coupling, and to the Jahn-Teller effects. One paper deals with intra-molecular electron transfer in three manifestations: 1) in traditional oxidation-reduction reactions; 2) in induced electron transfer; and 3) in mixed valence complexes. Another paper discusses the reactivity of polynuclear metal complexes involving metal-metal bonds with simple inorganic and organic molecules, particularly, polynuclear aggregates' basic structural forms and polynuclear's fluxional nature. One paper investigates the environmental effects of coordination compounds that disturb the natural balance and levels of metal ions and metal complexes in the ecosystem. The paper cites examples of pollutions caused by abnormal amounts of metal salts and metal complexes introduced in the ecosystem, and the presence of synthetic ligands or abnormal levels of natural ligands in the environment. 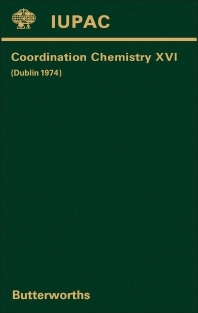 The compendium is suitable for analytical and organic chemists, chemical engineers, environmentalists, and students of biochemistry.